Twelve-year-old Amy Candler is perfect in every way. She has superhuman powers: Amy can perform like an Olympic gymnast, she knows the answer to every question in her classes, and she can see and hear things from a distance out of range for a normal person. But the one thing Amy cannot do is remember anything about her past. All she knows is that she keeps having a recurring nightmare that seems almost too real. She has a birthmark she is certain wasn't there yesterday, a strange man is taking pictures of her, and she keeps getting anonymous warnings to keep her talents to herself. Amy is in a race against time to piece together her identity before it is too late! As an adoptee, I have always had a fascination with adopted characters. Replica was one of the first series that I remember reading with that motif. I recently had a chance to repurchase the series, and this class was the perfect excuse to break them out! Rereading this now, as an adult, it’s not quite as good as I remembered, and I don’t really appreciate that the adopted kid is considered a freak. For kids, though, this is a great sci-fi cloning thriller. 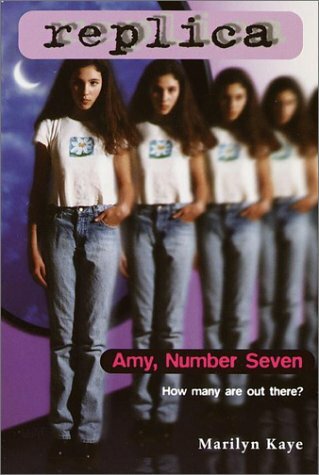 This particular title is all set-up for the series and focuses a lot on puberty as the catalyst for the changes that Amy is going through as a result of the genetic experiments that spawned her. As such, this first book is more appropriate for girls, as boys would probably be uncomfortable with those references. Later on in the series, though, there is a lot more action – and even a male clone named Andy – that would make the series enticing to boys as well.